Little did I know that all it would take to capture my interest in all things ( all edible things) squash, would be a single visit to a pumpkin patch. That fateful visit happened back in October in Wyoming, Minnesota. (Remember A road trip, a fresh pumpkin, and a pie?) Now, a month later, squash as become for me what a blank canvas is to an artist: a medium of almost infinite possibilities. Cakes, puddings, gnocchi, stews, breads, soups, and not forgetting the ever popular pie; you name it, it can probably be prepared with one of the many varieties of squash. Throughout the year, farmer's markets as well as the produce sections of many neighborhood grocery stores seem to come alive with all varieties of squash. While most are used as decorations especially at this time of year, a large number is edible. A few of my favorites are acorn, kabocha, butternut, but I can't wait to get my hands on the fairy tale pumpkin. Just as its name suggests, a mature fairy tale pumpkin is shaped like Cinderella's coach in the way that its segments are distinguished by deep ridges. Not to be confused with the cinderella pumpkin which also has deep ridges but whose top is more noticeably flattened. Stay tuned for at least one more "gourdish" recipe. Maybe I will be able to find a fairy tale pumpkin. Or not. Either way, the next recipe will be a sweet delight. 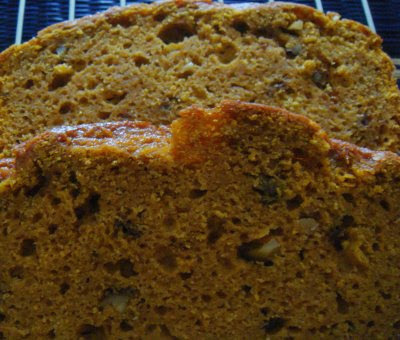 Meanwhile, enjoy this hearty pumpkin loaf made with homemade pumpkin puree. 1. Set oven to 350 degree F. Liberally grease and flour an 8' x 4' loaf pan and set aside. 2. Coarsely chop the hazel nuts and pecans and toast in the oven for 10 minutes. Remove and set aside until ready to use. 3. Combine the flours, baking powder, baking soda, cinnamon, nutmeg and salt. Set aside. 4. In another mixing bowl, whisk together the eggs, sugar, maple syrup, oil, and milk. Slowly whisk in pumpkin puree and add the freshly grated ginger. Combine the flour mixture into the wet ingredients in two batches. Finally, fold in the toasted chopped nuts. 5. Pour the batter into the prepared loaf pan and using a spatula smooth the top. Bake at 350 degrees F for 1 hour and 15 minutes or until the top is cracked and a knife inserted in the center comes out clean. Cook loaf in the pan on a wire rack before serving. *Homemade pumpkin puree: Wash and cut a 1 lb pie pumpkin into eight to ten segments. Remove and discard the seeds and stringy interior. Place the "cleaned" segments in a large pot with 1 to 2 inches of water. Set over medium high heat for 30 minutes until the pulp becomes soft and capable of being scraped out with a spoon. Remove pulp and puree in blender. Pour back into pot over medium high heat, and cook for 20 to 30 minutes to remove most of the liquid. i think i know the next recipe!!!! did the use the other pumpkin for this or another one?! aimee will like this recipe....cuz it's pumpkin. I have been cooking with pumpkin for two months now some sweet and some savory. There are so many things one can do with a pumpkin and not grow tired of it. Your bread looks scrumptious. Mmm..this looks and sounds delicious. I definitely want to try to make this one.